For the Gordon Jenkins-Johnny Mercer song, see P.S. I Love You (1934 song). "P.S. I Love You" is a song recorded by English rock band the Beatles in 1962. It was composed principally by Paul McCartney (credited to Lennon–McCartney), and produced by Ron Richards. The song was released in the UK on 5 October 1962 as the B-side of their debut single "Love Me Do" and is also included on their debut album Please Please Me (1963). It was later included on the American release Introducing The Beatles (1964), its reissue The Early Beatles (1965), and the Beatles compilation album Love Songs (1977). The version featured on the single and album was recorded in ten takes on 11 September 1962 at EMI's Abbey Road Studios, London. Producer George Martin had booked session drummer Andy White as a replacement for Pete Best, whom he considered not technically good enough for recording purposes; Martin had been unaware that the other Beatles had already replaced Pete Best with Ringo Starr, who attended the session and plays maracas on the song. White was a freelance show band and session drummer, and gave the recording a lightweight cha cha treatment. Martin was not present at the session, which was run by Ron Richards in his absence. Richards told the group that the song could not be the A-side of their single because of an earlier song with the same title: "I was originally a music publishing man, a plugger, so I knew someone had done a record with that title. I said to Paul, 'You can have it as B-side, but not an A-side.'" With Starr playing drums, the Beatles recorded the song at the BBC on 25 October 1962, 27 November 1962 and 17 June 1963 for subsequent broadcast on the BBC radio programmes Here We Go, Talent Spot and Pop Go the Beatles, respectively. The 17 June 1963 recording was officially published on the On Air – Live at the BBC Volume 2 album (2013). Melodically typical of McCartney's later writing style, the song demonstrates two notable exceptions to the contemporaneous model: during the opening chorus the chord D♭7 is placed incongruously between G and D (on write), and during the song’s title phrase a sudden shift to B♭ occurs underneath "P.S. I love you" which Ian MacDonald described as "a dark sidestep". Lennon contributes a single note harmony emphasising the beginning of each stanza. Lyrically constructed with their female audience in mind, the Beatles included it as part of their Cavern Club song set. No original master tapes of the 11 September version of "P.S. I Love You" are known to exist. Standard procedure at Abbey Road Studios at the time was to erase the original two-track session tape for singles once they had been "mixed down" to the (usually monaural) master tape used to press records. This was the fate of two Beatles singles (four songs): "Love Me Do", "P.S. I Love You", "She Loves You", and "I'll Get You". On its 20th anniversary, Parlophone re-issued "P.S. I Love You" as a picture disc, and shortly afterwards as a 12-inch disc. For their BBC sessions, including the 17 June 1963 recording published on the album On Air – Live at the BBC Volume 2 (2013), White is not present and Starr plays drums. Alvin and the Chipmunks for their album The Chipmunks Sing the Beatles Hits (1964). Peter Lipa on his album Beatles in Blue(s) (2003), which features cover versions of sixteen Beatles songs. Filipino actress and singer Jolina Magdangal covered the song on her album On Memory Lane (2000). ^ Harry 2000, p. 892. ^ a b c d MacDonald 2007, p. 61. ^ Lewisohn, Mark (2013). The Beatles: All These Years, Volume One – Tune In. New York: Crown Archetype. p. 626. ISBN 978-1-4000-8305-3. ^ MacDonald 2007, p. 61, footnote. ^ Miles 1997, p. 37. ^ Sheff 2000, p. 168. ^ "Beatles, The - Love Me Do at Discogs". discogs.com. Retrieved 26 April 2012. 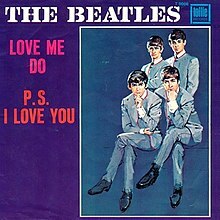 ^ "Love Me Do / P.S. I Love You by The Beatles". rateyourmusic.com. Retrieved 26 April 2012. ^ "Sonny Curtis - Beatle Hits Flamenco Style Guitar". Allmusic. Archived from the original on 27 August 2016. Retrieved 10 February 2018. ^ "The Chipmunks sing the Beatles hits". WorldCat. Retrieved 25 September 2018. ^ "The Hollyridge Strings - The Best of the Beatles Songbook". Allmusic. Archived from the original on 10 August 2016. Retrieved 10 February 2018. ^ "Peter Lipa - Beatles in Blue(s)". Allmusic. Retrieved 4 March 2018. ^ Deming, Mark. B-Sides the Beatles at AllMusic. Retrieved December 27, 2016. MacDonald, Ian (2007) . Revolution in the Head: The Beatles' Records and the Sixties. Chicago: Chicago Review Press. ISBN 978-1-55652-733-3. Sheff, David (2000). All We Are Saying. New York: St. Martin's Griffin. ISBN 0-312-25464-4. The Rolling Stone Illustrated History of Rock and Roll. Rolling Stone Press/Random House. 1976. ISBN 0-394-73238-3. Alan W. Pollack's Notes on "P.S. I Love You"
"The Surprising Influence of "P.S. I Love You", by CultureSonar". YouTube.com.